Striction BP has been on the market for a while, but is launching nationwide at GNC stores. With the product available to a whole new group of consumers, it should be examined if this is GNC’s best new heart health supplement. Here’s a closer look at what Striction BP offers. It is important for any person out there to have a healthy heart and manage blood pressure in general. It might not seem like a big deal early on in a person’s life, but as they age, it can have a huge impact. The last thing a person wants to do is wait until something catastrophic happens before heart health becomes more of a priority. Not taking care of your heart health can lead to a variety of health conditions and a possible visit to the emergency room. Any supplement is only going to work if the right ingredients are used. The good news about Striction BP is that the company made sure that only the fewest amounts of ingredients are you used to keep things simple for individuals. No one wants to sit there and read about 20 different ingredients that really do not serve much of a purpose. Ceylon Cinnamon is the top active ingredient in Striction BP. Many people see the word cinnamon and think that it is something similar to what is found in the grocery store. It is a bit milder which allows for higher dosages on a regular basis. It is very effective when it comes to lowering high blood pressure in a person’s body. Magnesium is another very valuable ingredient in the supplement. Magnesium is a natural ingredient in everyone’s daily diet, but most people out there definitely need more. Magnesium relaxes the blood vessels which allows them to expand and improve blood flow. Finally, Vitamin B6 is one of those vitamins people need a healthy dosage of, but many are lacking. This vitamin helps people stay healthy in a variety of ways, including the prevention of heart disease. It does so by helping the body avoid blood clots that could be very dangerous if formed. It also helps with adequate and efficient blood flow. 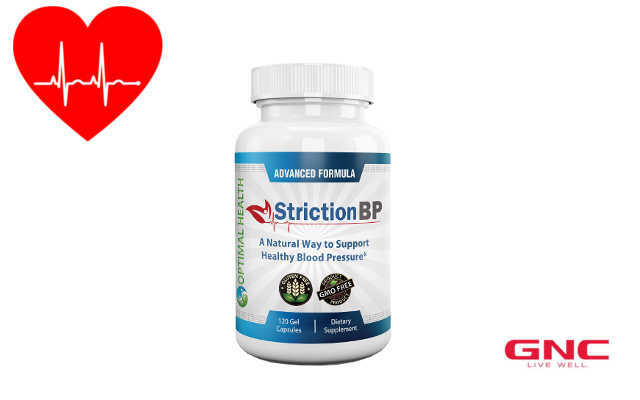 One reason why Striction BP is already one of the best options for a healthy heart at GNC comes down to the Striction BP review articles. Because the product has been on the market for some time, it has garnered a lot of positive reviews and publicity. Mommy Bloggers and Lifestyle Bloggers have commented on how well Striction BP works and how it is designed for both women and men alike. Reviews have echoed how it is an inexpensive way to get your blood pressure and heart health under control. The company, Optimal Health, recently announced that the supplement will be hitting GNC store shelves nationwide. It took a lot of hard work to finally make an appearance in one of the most well-known health and fitness stores in the United States. Along with GNC, the supplement can also be purchased directly through Optimal Health. This is convenient for those people who might not be close to a local GNC store. So, is Striction BP GNC’s Best New Heart Health Supplement? After reading reviews and the ingredient list, the next step was giving it a try. I knew that I had a pretty healthy heart overall, but I wanted to keep things that way. As a person ages, it can certainly sneak up. From the very beginning of my trial, it seemed like there was a difference in my body. The changes in blood flow were very noticeable. I didn’t think that I would be able to see changes as quickly as others, but this really seems to have an impact on just about anyone. Give it a try, especially those who are over 40 and have any blood pressure or heart health issues! It could be just the thing you need to get your heart health back on track.